The ale bowl was a prominent object in many rural Norwegian homes and farmhouses, especially during the period of 1750-1850 and well into the twentieth century. Norwegian farmers often brewed beer for important holidays and celebrations, such as weddings, funerals, baptisms, Christmas, and New Years, and this beer was generally served in ale bowls. The ale bowl was a fixture in the farmhouse and was an identity symbol of both status and fertility. While people came to the farm and left the farm through the generations, the ale bowl, along with other important furnishings and fixtures, remained on the farm. Thus, though the people were transient, the identity of the farm was constant and enduring. Some ale bowls were turned from green wood on a lathe and decorated with paint. Other ale bowls were hand carved, often in the form of birds. Still others reflected the imaginations of the makers and could take the form of dragons, rams, or most any real or mythical creature. Different regions of Norway tended to have their own characteristic styles of ale bowls. 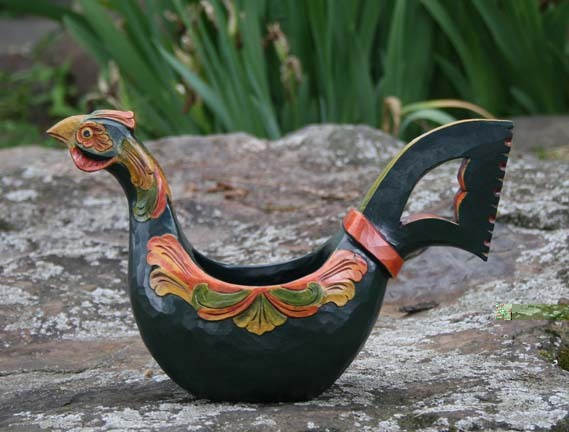 For example, along the west coast of Norway, especially near Voss, ale bowls had two heads patterned after dragons or even stylized horse heads. These were called Kjenge. In Gudbrandsdalen there was an ale bowl form with a hole bored in the neck below the carved head. The beer was poured from the hollowed cavity through the hole into another drinking vessel. The size of the ale bowls varied widely. Some were large enough to hold several liters of beer. These larger ale bowls frequently held smaller ale bowls, often in the forms of ducks or geese, which would float in the beer and could be used to dip the beer from the larger vessel. Phil became interested in ale bowls while attending the carving school in Norway, but it took a few years before he made his first ale bowl. On their numerous research trips back to Norway Phil and Else visited many museums and private collections to photograph and document sculpted ale bowls. Over the years Phil has probably made more original ale bowls than any one individual, past or present. Most of his ale bowls are one-of-a-kind from inception to completion. First Phil draws the overall shape of the ale bowl then he chooses a chunk of wood from which to form it. He sculpts the chunk into a rough pattern or blank, carefully considering the shape of the heads, the flow of the lines, and the feel of the bowl when held in the hands. Once the ale bowl is sculpted and the cavity is hollowed out the decoration can be drawn on the blank. After completing the carved decoration, his final step is to add a finish. Some ale bowls are stained and finished with Danish Oil or food-safe mineral oil. Other ale bowls will be painted with lively colors using acrylic paints. Some ale bowls are made to order while most are created from artistic inspiration and offered for sale. Please check out our For Sale page to see what there is available. Dragon ale bowl dark on red.